Helping your child cope during exam time. 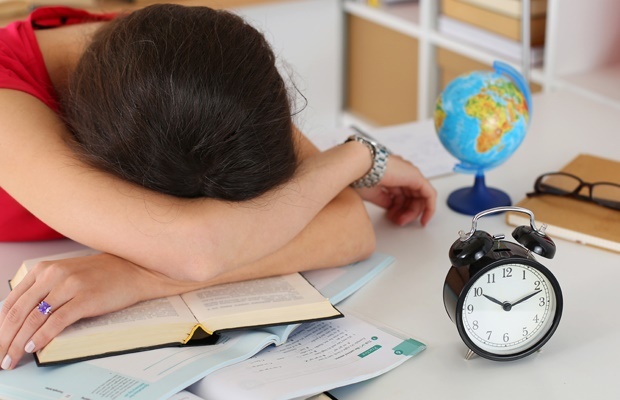 Exams times can be super stressful and often traumatic for any student. Read more: How does your family tackle studying for exams? Students often tend to stay up until ridiculous hours in an attempt to cram in as much information as possible. I remember during my time in high school when some of us would set our alarms for all sorts of crazy hours of the morning so that we'd wake up and study more. Pulling all-nighters and depriving yourself of sleep during exam time is possibly the worst solution when it comes to effective learning. It's far better to stick to a healthy sleep routine to enhance memory and brain-functions so that you actually remember the things you've been studying hard for. Turn off all electronic devises 30 minutes before bedtime and relax your mind before you go to sleep. Avoid caffeine, things that are high in sugar etc. You might think that foods which are high in energy will help you study better, but they're really just short term fixes and they're likely to make other important things such as sleep and fatigue a bigger long-term problem. Omega 3 is great for the brain so stick to foods that give you enough of your daily vitamin and mineral requirements. Check out more healthy food ideas for exams here. Music can elevate your mood and create a sense of calm if you're listening to the right tunes. Classical music is said to be a great way to restore your mind's concentration levels while getting into rhythm with whatever it is you're trying to study. Take a short break from studying every now and then and try rest your mind with music. Relaxation is a key factor when revising for exams. This is a great habit to get into and it’ll benefit you later on in life too. Start by only allowing yourself to check your phone’s messages once you’ve productively been studying every hour. When testing yourself on possible exam questions, think of a reward for yourself for when you achieve higher than 75 percent (or whatever your aim is). Meditation can strengthen your focusing skills. Although it might seem pretty boring and simple to do, if you practice it often enough medication can help you control your stress levels by distracting you from everything your brain has had to absorb throughout the day. When your mind is clear, your brain can take in a lot more than it normally would. Don’t leave things to the last minute. If you start studying earlier on in the semester you’re more likely to improve or even perfect some of the parrot-style learning methods. You’ll feel more confident too. Make them super colourful, friendly and bright. Often the things we need to revise can seem repetitive and bland and it helps to separate headings, paragraphs and categories by using bright colours or even pictures so that your mind is stimulated creatively. You'll probably find that you're able to remember more things by associating key words and important facts with colours and pictures.